The Top Hypnotherapist in Spain. Having trained in the UK, Jonathan has followed in his father’s footsteps as a master Hypnotherapist. 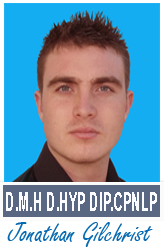 Unlike his father who works in Ireland Jonathan is resident and works in Spain permanently and deals with both English and Spanish clientele who wish to take advantage of Jonathan’s unique, and highly effective system – Fast Track Hypnosis. A brand of hypnosis, which out-paces the traditional routes, Fast Track Hypnosis leans on its efficiency to help people with the aim of doing so as quickly as possible. In these circumstances, traditional isn’t always best and even though we’re taught from a young age, ‘more haste, less speed,’ in our modern society, that isn’t always the answer. Fully trained in the slower, traditional roots of hypnotherapy, Jonathan has also studied his father’s innovative techniques and thanks to this training, there are now TWO practitioners of Fast Track Hypnosis in the whole world! “To some people, hypnotherapy is still pretty ‘out there’, but studies and reports spanning over two decades, prove the efficacy of hypnosis. It’s tried and tested and very much an effective treatment. “In regards to Fast Track Hypnosis, my father has proved that his condensed version of the traditional hypnotherapy works and in front of the media. He’s been featured on many a television programme over the years, broadcasting the amazing benefits of Fast Track Hypnosis. “I’m permanently based in Spain. My father works in the UK and Europe so I’ll also be dealing with clients in Spain and will now be expanding this to clinics right across the Costa Blanca throughout the year. In particular, the Spanish regions, as a lot of people have wanted my father’s Fast Track Hypnosis in Spanish and now, I can provide that.